A sports sponsor’s dream – OR nightmare! In the week 41 Irish and British players were handed Lions contracts, it was the contract of one of their potential opponents that made the headlines. 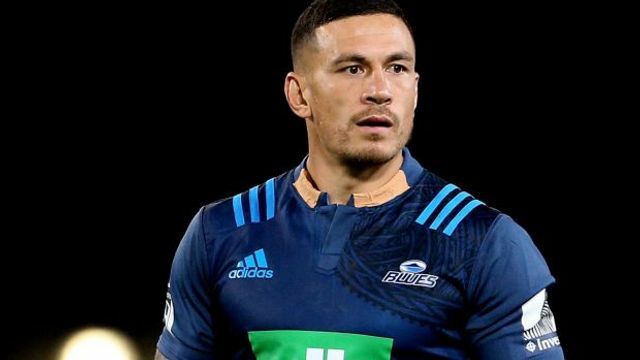 All Blacks centre, Sonny Bill Williams invoked a ‘conscientious objection’ clause in his contract which allowed him to cover the sponsor’s name on the collar of his jersey in a recent Super Rugby match. Williams is one of New Zealand’s highest paid and highest profile rugby players. In addition to his 33 All Black caps and two rugby world cup winner’s medals, he has 12 international rugby league caps (including being voted 2013 international rugby league player of the year) and is a former New Zealand Boxing Heavyweight champion. He is a sporting superstar. His next goal is to make the All Blacks squad for the upcoming Lions series, and the first step in that process is performing well for the Auckland Blues Super Rugby franchise. Auckland Blues’ sponsor Bank of New Zealand (BNZ) may beg to differ. Williams covered their logo with medical tape in his first game back after 7 months side-lined by injury because BNZ’s activities contravene his Muslim faith which does not permit the charging of interest on loans. A ‘conscientious objection’ clause in his contract with the New Zealand Rugby Union (NZRU) allows him to refuse to promote banks, alcohol or gambling companies on religious grounds. “I want to be clear that this is nothing personal against the BNZ or Investec,” Williams said. “My objection to wearing clothing that markets banks, alcohol and gambling companies is central to my religious beliefs and it is important to me to have been granted this exemption. "So while a logo on a jersey might seem like a small thing to some people, it is important to me that I do the right thing with regards to my faith and hope that people respect that. So what does the future hold, is it a case of Sponsors beware? In an ever increasingly secular society, it is easy to disregard religious beliefs and practices which have a real impact on sport. It remains to be seen how the issue would be dealt with in Ireland. It is surely only a matter of time before the chief executive of Bank of Ireland for example, who sponsor Leinster and Munster Rugby, is confronted with this. In such a scenario, it is incumbent on sponsors, management and governing bodies to do everything possible to ensure the best players are on the pitch, and I think between the NZRU, BNZ and Williams the right balance was struck between respect for players and sponsors. As for the future, it may be a case of watch this collar, as oppose to watch this space! Leman Solicitors is a specialist sports law firm based in Dublin which advises both players and sponsors on contracts. “I want to be clear that this is nothing personal against the BNZ or Investec,” Williams said. “My objection to wearing clothing that markets banks, alcohol and gambling companies is central to my religious beliefs, and it is important to me to have been granted this exemption. “As I learn more, and develop a deeper understanding of my faith, I am no longer comfortable doing things I used to do. “So while a logo on a jersey might seem like a small thing to some people, it is important to me that I do the right thing with regards to my faith and hope that people respect that.